This awesome guest post was written by Aamar Khwaja, Inventor of modgarden (Mod Garden). Aamar is a health advocate and on a mission to see everyone eat healthily. For many of us, exposure to toxins occurs on a regular basis simply due to our environment.Although there are multiple ways in which we can eliminate toxins from our diet, our beauty routine, and our cleaning products, there are still some toxins that we’re unable to completely protect ourselves from. For those who may live in big cities, exposure to air pollution, such as smog, secondhand smoke, and airborne chemicals is a daily battle. And even for those who live in smaller towns, air pollution can still be an issue to focus some of your attention towards. Preventative medicine can go a long way in helping us to neutralize the negative environmental effects that we might not have control over. Today, let’s focus on lung health. Even if you aren’t struggling with lung problems, there are plenty of natural herbs and vitamins to add into your diet to occasionally give your lungs a cleanse. 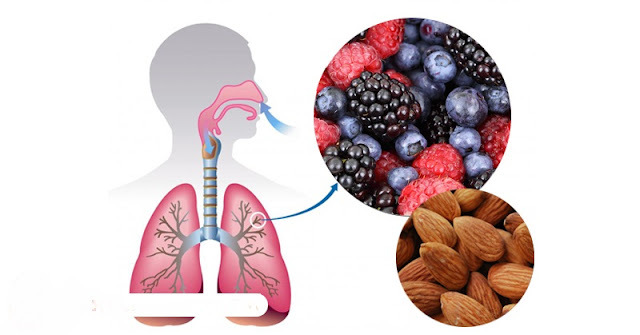 So, let’s jump right in and discuss the many ways in which you can aid your lungs this summer and make sure they stay as healthy as possible. As with many issues, consuming a whole foods diet can go a long way in aiding your body’s overall strength and immune system. The reasons for the importance of a whole foods diet can be traced back to our ancestors, who grazed constantly to find enough calories to survive. Ancient humans ate a largely plant-based raw food diet. However, eating a completely plant-based raw diet might not be the healthiest option either. Simply, it is of utmost importance to stay away from highly processed foods. Ninety percent of foods that Americans purchase yearly are processed foods primarily in the form of carbohydrates, such as grains, sugar, and fructose. These foods are utterly devoid of nutritional benefits, but also contribute heavily to common health problems such as excess body fat and obesity. Therefore, try to purchase only unprocessed whole foods that haven’t been tainted by excess sugar and carbs that really aren’t providing your body anything nourishing. We also recommend making a portion of your diet raw and lightly cooked foods. Whenever buying meats and eggs, make sure you select foods that are pastured organic, grass-fed, and free of additives, hormones, antibiotics, and other drugs. Always avoid meats from CAFO (confined animal feeding operations) and select meat from animals who are fed a natural diet and have free-range access to the outdoors. Choose organic, non-GMO vegetables free of pesticides, herbicides, and chemical fertilizers. Buy local whenever you can. Search out your local farmer’s market and find a few farmers who can supply you with high quality produce, meats, and/or cheeses to add to your kitchen on a regular basis. Support locally-grown, sustainable agriculture whenever you can. Joining a CSA (community supposed agriculture) is a fantastic way to get fruits and veggies on a weekly or bi-weekly basis. A recent study measured almost 2,000 adults and found that low fiber intake was often associated with reduced measures of lung function (1). According to the results, 68% of adults with the highest fiber consumption had normal lung function. Those with the lowest fiber intake only had 50% normal lung function. Additionally, people who ate a lot of fiber scored better on two breathing exercises. This indicated a larger lung capacity and the ability to exhale more air in a faster amount of time. Because the negative affects of fiber are relatively minimal, adding some additional fiber to your diet to improve lung health and strength is a fantastic idea. The importance of fiber extends beyond lung health. It can also help with blood sugar control, heart health, risk of stroke, weight loss, and overall skin health and quality. Whole foods that naturally contain both soluble and insoluble fiber are perfect to add to your diet this summer. Not only will these foods aid specific organs, fiber also serves as excellent support for the microorganisms that naturally live in your gut and contribute to your overall health. Whole foods with high levels of fiber include flax, hemp, and chia seeds (perfect for adding to your smoothies), berries, veggies (particularly broccoli and brussel sports), root veggies, and almonds. Because of all the wonderful work the respiratory system does for us on a daily basis, adding your herbs to your diet may help support this system to maintain overall health and function. Native to Australia, eucalyptus is one of the best herbs you can use to support respiratory and lung health. It is commonly used in cough lozenges and syrups due to a compound called cineole. Cineole is an expectorant, eases coughs, fights congestion, soothes irritation, and contains antioxidants. It is truly a fantastic herb to have on hand. Aptly named, lungwort has been used since the 1600s to promote lung health, clear congestion, and bronchial detoxification. Lungwort has a high mucilage content, which can help with respiratory conditions such as asthma and chronic bronchitis. Additionally, lungwort has antioxidant benefits. An herb that is easy to grow in your home, oregano is not only a great culinary herb but it has boasts several medicinal properties as well. Oregano naturally contains carvacrol and rosmarinic acid—these two compounds are natural decongestants and can help with respiratory distress as well as general overall lung function. Oregano has many health benefits, so keep some in your kitchen. Although the world is full of toxins, there are many ways in which we can actively work against the negative impact of these toxins. Your respiratory system is constantly working, allowing your body to take in oxygen. Unfortunately, this can also result in pollutants, irritants, dust, mold, and other toxins entering into your body. Luckily, there are some alternative options that can serve your body. Eating a whole foods diet, minimizing your exposure to as many toxic chemicals as possible, and adding some supplements to your daily routine can make a big difference in your overall health. Stay healthy.